A prospective client with whom I'd been speaking for several months said they weren't confident that I'd create adequate value to justify our engagement. That happens sometimes. It's the old sales rejection, "shake it off" sort of thing. But this one stung, because it seemed so intuitive. It seemed like a perfect use case for industrial B2B marketing and a good fit. We agreed to a pilot and spoke extensively about implementation. Since I was unwilling to proceed without that foundational insight we reached an impasse. But maybe they simply assumed, as many industrial manufacturers do, that everything they know about technical features is the practical extent of what's important to them and to buyers. That's a naive and expensive assumption - typically resulting from cognitive bias. As Dirty Harry said "A man's got to know his limitations." Too often cognitive bias prevents companies from taking critical steps to learn what they don't know they don't know. "We don't care if you like the messaging or not"
I love this quote from Mike Lieberman's (@Mike2Marketing) recent blog Your Inbound Marketing Content is For Them, NOT For You. Of course it's delivered with a bit of a Philly edge, and is provocatively hyperbolic. The point, though, is critically important. Companies that plan, develop and revise B2B marketing content for internal consumption will fail. Unlike The Fed that has a captive customer for it's products, companies have to actually sell - and that means help buyers understand the problems that they help solve with products and services, and what value is created. Nowhere on that list is the inventor's pet feature, the technical specs or the seller's assumptions of why they're competitively superior. And experience tells me that what seems like a minor shift in mindset is often an enormous impediment to B2B marketing success for industrial manufacturers. Producing content is irrelevant if it doesn't attract, convert and close prospects. And the tragedy of inbound marketing is that while the methodology has created incredible opportunity for companies to compete regardless of budget, it's also created a false sense that the act of creating content is the gateway factor. The opportunity cost of DiY and uninformed B2B marketing is astounding. Can you shift your view? 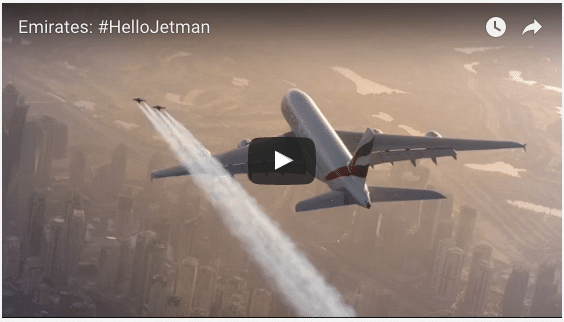 That's why I love this video from Emirates. What a radical challenge to the traditional way of looking at things! If I wanted to make a cool video with a powered wing, I would never think of flying formation with an A380! Can you bring the "JetMan's" audacity to the marketing and sales of your traditional industrial products/services? Can you overcome your cognitive bias? I hope the answer is yes, or that when we talk I'll be more successful in helping you understand why it's critical than I was speaking with another company last week. In the meantime, if you've started to experiment with inbound marketing for top line growth but are looking for more, check out this eBook on how to leverage the tools to actually empower sales. So many lament the divide between the two - let's stop wasting time complaining and just fix it!